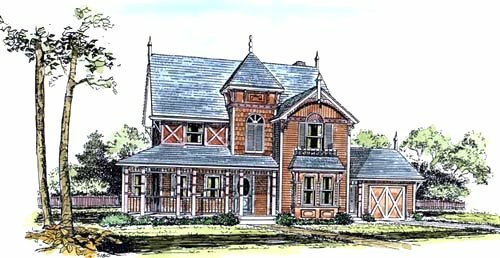 House Plan # 5180 - The gingerbread detailing of the Victorian style endures and the feeling is complete in this exterior, right down to the garage doors. House Design # 5180 has a great room, a parlor, a dining room, kitchen with dinette, three bedrooms, two baths and a foyer and vestibule, totaling 1,980 square feet of living space. There is a one-car garage that may be expanded, an attic, lavatory, firewood storage shed, and a butler's pantry. French doors lead from the great room to a rear terrace. The overall dimensions of 53 feet, 8 inches by 36 feet, 2 inches include a one-car garage. There is a full basement.